MasterkeyPro™ is used to design, create and maintain your master keying systems from start to finish, simple or complex. If you're an experienced professional locksmith or a novice you'll find our unique combination of ease and power is just what you need to get your master keying jobs done right the first time. Master keying locks by hand can present many challenges and be very time consuming to say the least. This can lead to possible errors in your systems and add a lot of unnecessary stress and worries to your jobs. That's where MasterkeyPro comes in. You'll be able to create master keying systems that will be easy for you to use and understand, showing you exactly what pins to put in each chamber. This allows you to work much faster with confidence. All this in as little as 3 simple steps, or choose from several customizing features depending on your skill level. 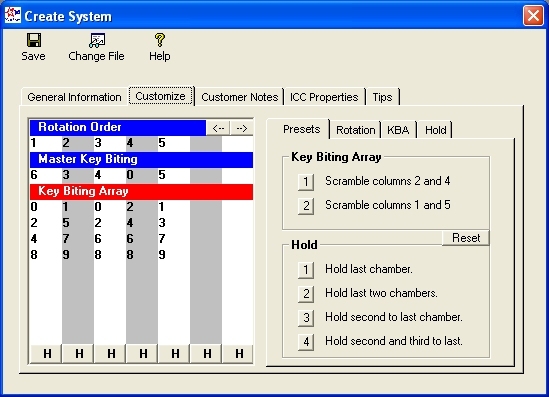 MasterkeyPro can generate thousands of change keys in a matter of seconds. It will calculate all the bottom pins, master pins and tag all the sub masters for you and much more. 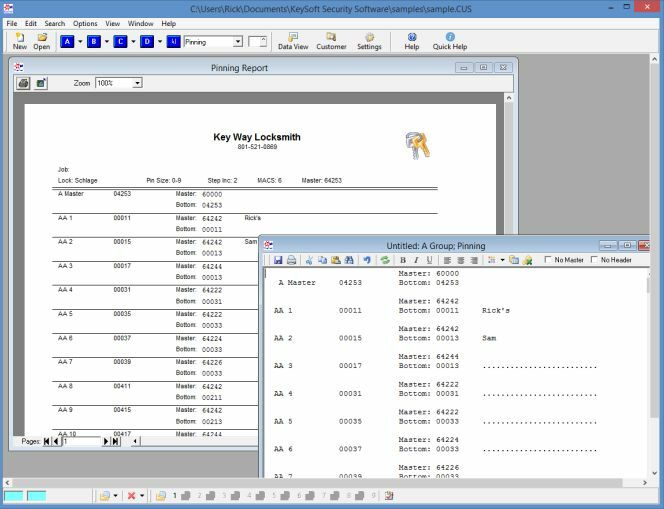 If you need to recreate an existing master keying system, or create one from scratch, this is the software for you. Are you new to master keying? don't worry about that, learn the basics with our "Basic Master Keying" section in our MasterkeyPro Help file. Plus you'll get free product support if needed. With MasterkeyPro you'll have plenty of "bells and whistles" that will allow you to fully customize your master key systems and go way beyond a hand written system. Do standard progressions with or without customizing. 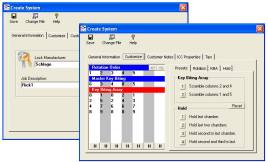 Use MasterkeyPro to create or recreate virtually any type of master key system. Design, create and maintain systems like Schlage, Weiser, Kwikset, EZ-Set, Corbin Russwin, Best as well as many more, or enter your own lock manufacturers information. If you're working with a lock manufacturer that is not listed you can easily add it to the list for the next time you need it. Using a Rotating Constant system can have several advantages over the standard type progressing systems. It's a method for master keying locks that will give you the most change keys with a least amount of master pins. (As many as 20 change keys using only one master pin, for the whole cylinder) Because you're using fewer master pins you'll not only key them up a lot faster but this will also give you a more secure master keying system. MasterkeyPro comes with an easy Cross Keying feature that will let you create and save all your Cross Keying information. Cross Keying is how you make more than one "Change Key" operate a single cylinder. Normally this is done on common doors that need to be accessed by more than one person, as in a supply room or main entry door. It will show you how to stack pins for keys you want to fit a cylinder. Know ALL the keys that fit an existing cylinder with stacked pins, how to plan your Cross Keying jobs and much more. Interchangeable Cores (ICC's) are getting used more and more everyday, so we've included some of the most popular ICC's including the following, All Best/Falcon types, Corbin/Russwin, Sargent, Schlage, Medeco and Assa. The Control Key Notes remind you of any rules you must follow for the selected ICC. Making ICC's easy. Why pay hundreds more to do interchangeable cores. It's all included with your MasterkeyPro purchase.